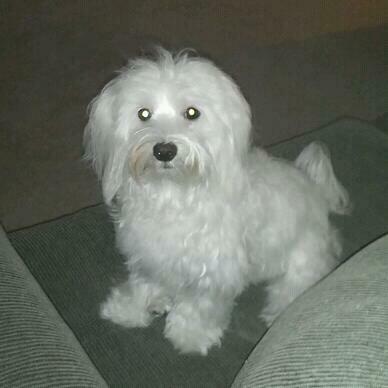 We have a male Coton, Ollie, he is 1 and half years old. We is an alpha dog with a great personality. Even though is an Alpha dog, he gets skittish around people he doesn't know very well. Once he gets used to you, then he is fine. He's a happy dog and keeps us entertained. It's just me and my husband in the home. The problem we have him. Is licking!!! Ollie didn't start the licking right away, but, started this real bad in the last six months. He is well trained. He's potty trained, crate trained while we are away, but does sleep with us. When we have visitors, it's embarassing, because he will not stop licking them! We have really been working with him not to lick so much and he seems better with us, but, as soon as a neighbor stops by or family and freinds come to visit, he acts almost uncontrollable with his urge to constantly lick. We know that licking is a dog's way of showing affection and love, but, this type of licking is different. You can hardly pet him because he is attacking your hands to lick them. Help!! Can someone tell us something we can try to calm him this habit down. Believe me, he gets plenty of love, petting and affection from us. My husband is retired and home all day and they are best buddies. When I'm home, he loves lying beside me in my chair and we play with him alot. He truly is the best dog we have ever had!! I have the same problem with our dog Molly. There's nothing we can do to stop her from doing it. I wish I could tell you some wonderful training tool to correct it but I just think it's something that this breed or a dog just does. My girl Cali-Kat is a licker as well. I agree that it is a soothing method for them, like thumb sucking! She seems to be most attracted to me when I am fresh out of the shower with oil or lotion on my body - and to others when they have just put hand or foot lotion on. My only real concern is will ingesting the lotions or scented body oils harm her ... She is 4 years old & has been doing this since I got her when she was 9 mos; till now she has shown no health issues! BTW, my Cali-Kat looks just like that cute little 'Ollie'. No lick is just like teaching a dog to sit. When he starts u say Ah! Ah! is a sharp pitch No Lick! The second he stops treat. If he is sitting on a neighbor lap and he starts to lick tell the neighbor to say the same then put him down on the floor. He licks he gets down. This also means it is not ok to lick sometimes but not others. It is either no lick or a habit u put up with. It is like jumping up to greet. They do not know the difference between rain and dry so they either jump to greet or not. This way if ur laying in bed and they start to lick at their paws which they can sometimes atart to lick and obsess, u say Ah1 Ah! No lick they stop. Now if they r lick obsessing at a part of their body please check 1st before u command to stop they have no jaggers or maybe something on their paws or stuck in fur or something sticky they have gotten into. They have maybe picked up something from a walk (wipe off w/washcloth) check between toes and on the bottom between the pads to make sure nothing has gotten lodged or stuck to the hair on their feet. Remember every thing to a dog is black and white. They either r allowed or they r not allowed their is no inbetween. I have a Coton and a Chipin - both try to lick everyone in sight - and my Chipin will even lick a wall at times. I spoke to my vet and he stated that licking like this is showing submission to you or your guests. Dogs do do not really relate in human terms and do not see licking as love or kissing, they see it as a way to get a feel (and taste) of their pack or a stranger entering the pack. Basically a dog learns the licking behavior from the mom, who grooms them that way - and also will licks her puppies to calm them. While it isn't really a bad thing it sure is annoying when they are jumping and licking. I got myself a little water spray bottle and when the excited licking started I would say OUT in a firm tone and then spray - I did this only 3 times and now all I have to do is say OUT and the licking stops. I still let my dogs greet everyone, and let them give one or 2 licks - but that is it - I say OUT and they both go off into a new direction. The good thing about this is that I now can use the word OUT for other things as well. :) The behavior I am addressing immediately stops. Let us know if you find something that works. Our trudy is a licker too...we don't mind it so much..is sorta sweet really..but..yeah..it does get a little embarrassing when my friends come in and she licks their shoes and toes and hands...Not every body loves it and i wish i could tell her when it is okay and when it isnt. Usually..with us..when we had enough we say : trudy..that is enough now, leave it. and she does pretty good with that but with guest i think the excitement takes over. its not the worst flaw ever..but if u do find something that works let me know..i d be curious to try it with trudy too. We have a male and female Coton. Both lick a lot, but the male is worse. He is very loving and will practically lick you to death. I'm wondering if this is a Coton trait. I don't mind the licking, but I know that not everyone agrees. I will be so curious and eager to hear what feedback comes about this. I have 2 Cotons - Fenway is 3 1/2 and Riley is 3. They both lick like crazy!! Very similar to what you described in training and other behaviors. I work from home 100% of the time, so they are with me all day long. My vet thinks it is similar to "thumb sucking" but I'd be curious what others think.